Bank guarantees in Spain are a legal tool devised to secure the deposits of off-plan buyers should their properties not be delivered on time or their developers file for bankruptcy. Post-credit-crunch, bank guarantees are acting as safety nets for many purchasers in dire cases. Law 57/68 rules on bank guarantees. Bank guarantees in Spain have been a controversial subject over the last years which have sparked heated debates. Regrettably I have witnessed how some financial institutions are in fact refusing to honour bank guarantees. It is in such cases in which the need of a specialized litigation lawyer comes into play to help enforce them before a law court. Bank guarantees may be a daunting minefield for many albeit with the assistance of an independent lawyer acting on your side you will be able to waive the pitfalls both safely and successfully. The purpose of this article, along with my article on Licence of First Occupation, is to pave the way for my upcoming article on Buying Off-Plan in Spain. These are essential mosaic articles that allow a focused study on a particular subject and, as a jigsaw puzzle, are part of a broader picture which aims to shed light on buying off-plan property in Spain. I recommend this article is read in tandem with Supreme Court Rulings on Bank Guarantees and Law 20/2015 New Bank Guarantee Legislation which changes and shapes our understanding on how bank guarantees work in practice. Buying off-plan property in Spain has many advantages but also its associated risks. It is important would-be buyers fully understand what this implies. Not long ago it was normal to obtain a significant discount (premium) on buying off-plan as you assumed a risk (mainly the uncertainty of the property ever being delivered and the time elapsed until completion) until the unit was ready to be delivered legally (with a Licence of First Occupation, in Spanish ‘Licencia de Primera Ocupacion’). Many took advantage in the boom years selling on these properties for a sizeable profit prior to completion (also known as ‘flipping’) as it was basically a leveraged investment which only required a fraction of the funds to be paid up front. That same off-plan dwelling was significantly more expensive (i.e. 30%) if you purchased it key-ready as once completed there was no inherent risk. The whole purpose of bank guarantees is precisely to offset the ‘waiting risk’ until a property is completed. They are devised to mitigate, if not completely remove, the financial risk associated to a developer not completing a development and pocketing your deposits. In this manner they would act as safety nets and the buyer would be able to recover their deposits in full plus the legal interest. That’s the theory anyhow. In practice it is a tad more complex. The off-plan meltdown gradually cooled off leading us onto today’s depressed market. Off-plan hazards nowadays frequently outweigh the rewards, making the prospect of buying resale property in Spain or let-to-buy in Spain look far more appealing; particularly in light of the large stock of readily available property. That is until the dust settles and the market picks up again kick-starting a new property boom. Property cycles in Spain take, on average, 15 years from peak-to-trough. The last cycle has taken from 1993 to 2007. To be perfectly honest, this time recovery will foreseeably take ‘somewhat’ longer to materialise. Don’t hold your breath. What is a Spanish Bank Guarantee? A Spanish bank guarantee can be either an insurance policy or a guarantee issued respectively by an insurance company or a bank. In this article, for simplicity’s sake, I will group both types under the generic term ‘bank guarantee’. A bank guarantee’s purpose is to secure the full amount of deposits paid by off-plan purchasers. It secures the initial reservation deposit, which strikes the property off the market, the interim or stage payments as well as the applicable VAT paid on said amounts. On top of this you are also entitled to the legal interests on the amounts secured. Bank guarantees are mandatory and should be available to all buyers of new-build property. A bank guarantee has high set-up costs. Law states this expense must be borne and maintained by the developer. If your developer wants to force you to pay for these costs you must report them to your local or regional consumer protection office who will fine them heavily. A bank guarantee is of critical importance acting as a safety net securing your full deposits should something go awry. It goes without saying that a buyer must always keep careful record of all advanced payments. I mention this specifically when one uses the services of currency exchange companies (which have very competitive rates) as your money actually goes into one of their accounts, not the developers. On completion a notary will require prove of all payments made for money laundering purposes. You want a complete audit trail of all monies involved in the purchase. How long does the Protection of a Bank Guarantee Last? In strict accordance with article 4 of Law 57/68 bank guarantees have no expiration date. They should only expire upon the granting of the Licence of First Occupation by the town hall where the property is located. In practice this seldom happens and almost all bank guarantees are issued with an expiration date spanning typically 2 years. It is critical that your appointed conveyance lawyer renews them on time so your deposits are secured at all times. 1. Name & surname of purchaser/s. 2. Their nationality & passport number/s. 4. The exact amount in Euros which is being guaranteed. 6. The name and address of the development where they are purchasing. 7. The details of the residential unit they are purchasing i.e. Block 1, second floor, flat F.
8. Name & seal of the bank or insurance company guaranteeing underwriting the stage payments. If it is a bank guarantee, the number of the ‘Registro Especial de Avales’ as well as the bank account details where the amounts secured will be lodged. Law 57/1968 rules the protection of stage payments in off-plan properties. This very short law of only seven articles was enacted to secure the stage payments of purchasers should, for example, a developer file for creditor protection or the build be cancelled for planning reasons and thus not delivered in the stipulated deadline. Bank guarantees are only applicable to off-plan properties, not to resale property. 1. Article 1 rules that developers will have to provide free of charge to purchasers a bank guarantee or insurance policy (henceforth bank guarantee for either type) to guarantee the refund of their stage payments plus 6% interest in the event of the developer becoming insolvent. Spain’s Building Act (Law 38/99) actually amends this percentage in its first additional disposition and it will be the legal interest set in the Budget Law published annually by Spain’s Law Gazette (‘Boletín Oficial del Estado’). These legal interests are simple annual interests, not compounded. For 2013 the legal interest has been set at 4% by the Government. However if a developer expressly accepts the 6% interest set in Law 57/68 then said interest overrules the legal interest (which is currently lower). * Small digression. Almost all developments in Spain are delivered late so this remark by the law is advised to be taken with a pinch – or two – of salt. Please read point one of my article: “10 Reasons why your case Against a Developer may be thrown out of Court in Spain”. I would say a reasonable delay spans six to twelve months. Some judges are of the opinion that six months is not enough time to consider it a contractual default. Moreover developers, assisted by very competent lawyers, can successfully argue that unforeseen events (force majeure as per art 1105 of the Spanish Civil Code, SCC), such as strikes, bad weather etc. may impact on delivery pushing it back. If they are able to justify the delay, this extra time will not count against them. That’s why caution is the key word here before getting trigger-happy on suing. Litigation is a double-edged sword that needs to be wielded both carefully and responsibly as it may backfire at your own expense. It should not be entered into light-heartedly. Be very wary of law firms pitching you have a ‘strong case’ and making far-fetched promises of 95% success rate claims. You may have a strong case, not. Another fact worthy of highlight is that only because a PPC has a specific clause whereby it is mentioned that a buyer has a bank guarantee securing their funds this does not actually mean they have one. You have to be thorough and crosscheck with your lawyer that you do in fact have a bank guarantee issued under your name securing all your deposits including the initial reservation fee. In fact, ask to see it. Better safe than sorry. This may annoy your appointed lawyer (it would make me grumble!) but it is necessary – this is your money at stake, no one else’s. You have a right to ensure your stage payments are fully protected. 3. Article 3 stipulates that if the deadline to hand over the property is surpassed without the development being finished – or even started – the purchaser, at his own choice, may either rescind the contract executing the bank guarantee claiming a full return of the deposits plus legal interests accrued in the interim or else grant a developer an extension to complete the property. The latter must be expressly accepted, in writing, by the buyer with an addendum to the PPC reflecting this extension to the delivery date of the property signed by the developer and buyer (or else his appointed legal representative). 1. As from the time a developer attains a Licence of First Occupation from the town hall’s planning department. 2. The developer makes the new-build property available to a buyer (as in physically handing it over to him). Expedida la cédula de habitabilidad por la Delegación Provincial del Ministerio de la Vivienda y acreditada por el promotor la entrega de la vivienda al comprador, se cancelarán las garantías otorgadas por la Entidad aseguradora o avalista. At completion the purchaser’s conveyance lawyer will hand over all bank guarantees to the developer’s appointed legal representative. 5. Article 5 stipulates the obligation of the developer in the PPC, and all related publicity, to mention specifically the details of the financial services provider guaranteeing the payments and the special escrow account where your payments will be paid into (name of bank, account number). 6. Article 6 has been revoked. 7. Article 7 stipulates the Consumer’s Rights set forth in this law cannot be waived by the purchasing party even if they agree to it. The purchaser’s rights set forth in law 57/68 are inalienable under any circumstance. Bank guarantees ideally can be claimed upon immediately by the purchaser in case the developer defaults or the property not being delivered. However post credit crunch this is no longer the case as some banks are refusing to honour them. Prior to executing it, it actually requires a judge’s ruling stating that the bank ought to refund – or not – the off-plan purchaser. This means the purchaser will actually have to engage the services of a specialized litigation lawyer who will claim upon said bank guarantee in a special executive procedure. The litigation expenses are borne initially by the purchaser up front albeit may be claimed back from the bank together with the full refund of the stage payments and legal interests. This Executive procedure is much swifter than an ordinary court procedure spanning normally between 3 to 8 months. This is the most common type of bank guarantee which is set-up and one cannot argue that it is illegal or unlawful; it is only less practical if banks happen to refuse honouring them. This is just a standard bank guarantee which includes a special clause by which it can be claimed upon immediately by the conveyance lawyer without the need of a judge’s ruling. The bank cannot refuse to honour it. This is really the ideal bank guarantee to have because it saves the hassle, stress and additional expenses of having to go through a court procedure, even if it’s an Executive one. Sadly, it is very infrequent. Who requests a Bank Guarantee? Ideally a developer should hand you over the bank guarantees without even having to request them, this seldom occurs of course. In practice it is the duty of the conveyance lawyer you appoint to follow this up and request it. If you have appointed no lawyer then it will be up to yourself to request it from the developer. The developer in turn will arrange with the bank or insurance company underwriting the whole development the set-up of bank guarantees. After having paid the initial security deposit which strikes the property off the market, you are typically expected to make interim payments which amount, on average, to 30 or 40% of the property’s value. These payments are normally made in regular instalments (i.e. three or four quarterly payments). Your lawyer will then request from the developer one bank guarantee at a time to cover each and every instalment besides the initial security deposit. So normally your lawyer will have one bank guarantee for each of your stage payments securing the full amount. As per this law a developer cannot charge to issue a mandatory bank guarantee. Issuing a bank guarantee has high set-up fees for the developer as they must allocate an amount of money in a special bank account besides being an opportunity cost for them as they could put to work these funds elsewhere. This may help to explain why some developers are reluctant to hand them out unless the purchaser’s lawyer has requested them previously. When are Bank Guarantees Issued? Bank guarantees are issued normally 30 to 40 days after you make a down payment. Naturally a bank or insurance company cannot issue a bank guarantee if you have not paid the stage payment. In other words, a bank guarantee cannot be issued prior to handing over the stage payment to a developer as some people are advocating publicly. This just shows a lack of understanding, however wishful, on how the system works in practice. Advice such as: “do not make any payments to the developer without a bank guarantee” are flawed. First you pay, only then will you be issued a bank guarantee. Obviously if you’ve already made one payment and several months have elapsed and there is no bank guarantee forthcoming and you are shortly expected, under binding contractual terms of the PPC, to make further payments you should be wary and seek legal advice. It is risky to keep handing money over if your first stage payments have not been guaranteed yet. I am building my own dream-villa, should the constructor hand me a bank guarantee? The simple answer is no. In this particular case in which a person has bought a plot of land and they are building their own detached villa the Building Act regards them as self-developers. The constructor is hired by them and is acting on their behalf. In this particular case bank guarantees are not applicable as the purchaser is the developer. However, Law requires the self-developer to arrange the mandatory Ten-Year Insurance (Seguro Decenal). A lack of compliance attaining this mandatory insurance will result in this self-developer being forbidden to sell their house within the next ten years whilst alive unless expressly waived by a purchaser. This leaves the door ajar to problems which are best examined in another article. There are far too many pitfalls to be included as a comprehensive list in my brief bank guarantee overview. Please take professional advice from your appointed lawyer on this matter. 1. The bank guarantee’s expiration is conditioned to attaining the Certificate of End of Construction (CEC) instead of the Licence of First Occupation. Law 57/68 sets forth in article 4 that the bank guarantee should be valid until attaining the Licence of First Occupation. The problem is that a CEC, which is the prerequisite prior to the granting of a LFO, doesn’t mean the development is regarded as legal. In fact the CEC is issued by the architect in charge of the development who is actually on the developer’s payroll. Besides contradicting the specific wording of said law this clause should not be accepted as a development, despite having a Certificate of End of Construction, may not be legal. The CEC bears no relevance whatsoever on whether a development is legal or not. 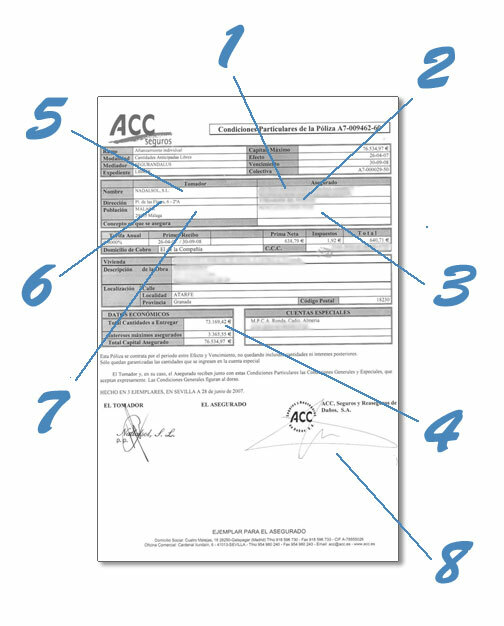 Moreover, for a Certificate of End of Construction to be valid it must be signed by the architect, technical architect (‘aparejador’) and must be approved and countersigned with the official seals of both the architect’s regional college and technical architect’s regional college. So a Certificate of End of Construction signed by only one of them would not be deemed valid and bears no significance on the legality of a development. Only the Licence of First Occupation does. For more details on this, please read my article on Licence of First Occupation. 2. The bank guarantee is conditioned to an expiry date. This is fairly common and contradicts blatantly both the spirit and wording of the law. The problem with expiry dates is that almost all developments are handed late for one reason or another. The danger in including expiry dates is that if the development isn’t finished on time as per the clauses in the Private Purchase Contract and the deadline is overrun the bank guarantee will cease to be valid. However this is a subject of hot controversy between lawyers and judges as there are many who believe that the inclusion of expiry dates is null and void as it goes against the Law (article 4 of law 57/68). This will remain contentious until there is a string of likeminded rulings from the Higher Courts. In the meantime being practical, I would advise to renew a bank guarantee to ensure your financial interests are secured at all times should the worst come to the worst. 3. Cowboy Insurance Companies. On the wake of the long-lasting property boom many such cases have been reported in the media. Invariably these rogue insurance companies are incorporated abroad specifically to be outside the reach of the Spanish jurisdiction. On doing this they waive Spain’s requirements and should the developer default, they are purposely unable to back up the bank guarantees or insurance policies they have undersigned. The process to make them accountable for is long, winding, expensive and often fruitless. That is why I strongly advise that whichever bank or insurance company which issues a bank guarantees is located within Spanish territory as a precaution, to be under the supervision of the Spanish authorities. The DGSFP’s website (Spain’s official body responsible for the supervision of insurance companies) has a list of unauthorised insurance companies which are neither registered nor authorised to trade in Spain. Under no circumstances should you enter into a contract with the above listed companies. This list is updated, from time to time. 4. Group or collective bank guarantee whose beneficiary is not the purchaser. This happens typically when investors buy from the developer, at a discounted price, a whole development or a large number of units to resell it abroad in the UK or in Ireland at a higher price. The bank guarantee will be under the name of the investors and not under the name of the end-buyer as it should legally. These bank guarantees are normally for a very high amount of money (millions of euros) as they group various residential units. They are extremely difficult to claim upon legally making them in practice worthless. 5. My bank, or insurance company, does not honour my bank guarantee. Post credit crunch it is renowned that some banks and insurance companies are refusing to honour them as has been highlighted by the Bank of Spain itself in 2008. In this case a specific executive procedure may be followed by your lawyer as a bank guarantee is regarded as an Executive Title. However, not in all cases is it recommendable to follow this executive procedure and your litigation lawyer will advise accordingly on a case-by-case. Consider it as a tactic devised to wear you out as litigation is daunting for many and requires liquidity as it must be paid up front. The expenses may be recouped from the other party later on. I am very critical of how the whole affair on bank guarantees has been grossly mishandled by those tasked to oversee it. There has been far too much complacency involved which has resulted in the abuse of the good faith of thousands of foreign buyers. This should be addressed urgently so this does not repeat itself again and assist, as much as possible, those who are already caught in its web. In my personal opinion, this 45-year-old law, hearkening back to the pre-constitutional Franco regime, needs some serious reworking as it allows many loopholes because of its poor wording. The Spanish Government would do well to understand that foreign off-plan buyers rely heavily on bank guarantees to invest in new builds. If the Government wants to kickstart Spain’s real estate sector it should address as a priority sensitive issues such as law 57/68 in advance of a new property cycle. Only then will foreign investors have renewed faith in our legal system to buy again off-plan with trust. Larraín Nesbitt Lawyers is a law firm specialized in conveyancing, taxation, inheritance, and litigation. We will be very pleased to discuss your matter with you. You can contact us by e-mail at info@larrainnesbitt.com, by telephone on (+34) 952 19 22 88 or by completing our contact form. 2.008 and 2.013 © Raymundo Larraín Nesbitt, All rights reserved.